I like trying new recipes and had several on the menu this week. They’ve all been good. 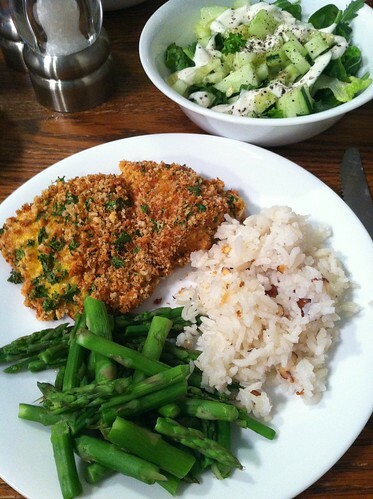 This evening we had Super-Crisp Oven Baked Fish and Parmesan Rice Pilaf. I had planned to try a different recipe for the fish, but when I took a look at it, it required frying the fish, then finishing it by baking it in the oven. I wanted a recipe that just baked the fish, so I looked for a different one. This one was very good and did have a nice crispy crust. I made my own bread crumbs for the recipe. Easy to do with a food processor and so much cheaper than buying them from the store. Just process as many slices as you want in a food processor. Add a dribble of olive oil while processing. You can also add spices, salt/pepper, herbs, etc. Up to you. Spread the crumbs on a cookie sheet and toast in the oven at 350 for 10-15 minutes. Stir a few times while toasting. Done when crisp. For this recipe, I used fresh snapper and fresh tilapia that our middle daughter brought home from the “big city.” There isn’t much option in our small town for getting any kind of fresh fish. Unless you’re a fisherman with access to someone’s pond. Next time I make the baked fish, I will add a tablespoon of Dijon mustard to the egg mixture. And maybe some freshly granted lemon rind. Also, I didn’t have yogurt, so I substituted light mayo in the egg mixture. The rice was also good. Our youngest daughter (loves rice) gave it a thumbs up. Here’s the way I tweaked the rice recipe. Melt the butter in a saucepan. Add the rice, the salt, and the garlic powder. Cook, stirring now and then, for three minutes. Add the chicken broth and the pepper. Bring to a rolling boil. Cover and reduce heat to lowest setting. Cook for 20 minutes. Add toasted almonds, parsley and Parmesan. Stir well and serve. It would be good with peas and diced carrots in it. The salad was good. Romaine, spinach, arugula and diced cucumber with freshly grated black pepper. Steamed asparagus rounded out the meal. We’ll be having this again. This entry was written by ~~Rhonda, posted on January 31, 2013 at 9:44 pm, filed under Recipes. Bookmark the permalink. Follow any comments here with the RSS feed for this post. Post a comment or leave a trackback: Trackback URL.